Background and objectives Metabolomics is instrumental in identifying novel biomarkers of kidney function to aid in the prevention and management of CKD. However, data linking the metabolome to incident eGFR are sparse, particularly in Asian populations with different genetic backgrounds and environmental exposures. Therefore, we aimed to investigate the associations of amino acid and acylcarnitine profiles with change in eGFR in a Chinese cohort. Design, setting, participants, & measurements This study included 1765 community-living Chinese adults aged 50–70 years with baseline eGFR≥60 ml/min per 1.73 m2. At baseline, 22 amino acids and 34 acylcarnitines in plasma were quantified by gas or liquid chromatography coupled with mass spectrometry. Annual rate of change in eGFR was calculated, and incident eGFR decline was defined as eGFR<60 ml/min per 1.73 m2 by the end of 6 years of follow-up. Results The mean (SD) unadjusted annual change in eGFR was 2.2±2.0 ml/min per 1.73 m2 and the incidence of reduced eGFR was 16%. After Bonferroni correction, 13 of 56 metabolites were significantly associated with annual eGFR change. After multivariable adjustment of baseline covariates, including baseline eGFR, seven of the 13 metabolites, including cysteine, long-chain acylcarnitines (C14:1OH, C18, C18:2, and C20:4), and other acylcarnitines (C3DC and C10), were significantly associated with incident reduced eGFR (relative risks ranged from 1.16 to 1.25 per SD increment of metabolites; P<3.8E-03 after Bonferroni correction of multiple testing of the 13 metabolites). Moreover, principal component analysis identified two factors, consisting of cysteine and long-chain acylcarnitines, respectively, that were associated with incident reduced eGFR. 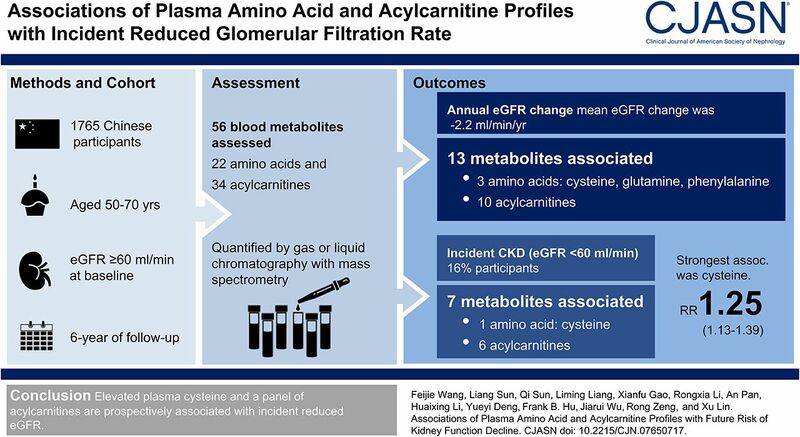 Conclusions Elevated plasma levels of cysteine and a panel of acylcarnitines were associated with a higher incidence of reduced eGFR in Chinese adults, independent of baseline eGFR and other conventional risk factors.